Plasma is the considered to be the fourth state of matter – after solids, liquids, and gases. If you heat up a gas intense enough, you can turn it to plasma. The extra energy blasts negatively-charged electrons off of the atoms that make up the gas, and divides the gas into positively charged ions and loose electrons. Plasma radiates visible light and heat. The electrons continue to be attracted to the ions, and re-attach themselves as soon as the energy or heat diminishes, which makes plasma unstable and doesn't last very long enough to constitute a Jedi lightsaber. We see plasma every day. The sun itself is made out of plasma, being a giant ball of superheated glowing hydrogen. Lightning is an example of the gases in the atmosphere igniting into a streak of plasma as an electric discharge crashes from sky to Earth. Neon and fluorescent tubes (reminiscent of a lightsaber) are also examples of an electric charge igniting a gas, although at lower temperatures. The closest we have in reality to a lightsaber are plasma guns. Plasma guns are used extensively to coat surfaces with thin films of other materials. They're also used in the construction of all aircraft engines. Large volumes of gas are blasted through an electric arc, or by radio waves or even microwaves. This energizes the gas to a plasma state. Temperatures of 6,600 C to 16,600 C can be reached, which exceeds the surface temperature of the sun. If the technology is there, shouldn't it be easy to build a plasma Jedi lightsaber? Unfortunately there are a few technical challenges, especially if you want to look more like a Jedi than a full tank. The most daunting challenge is that since plasma is the fourth state of matter after gas, it is extremely hot. Hydrogen plasma is the one of the cooler plasmas, and it comes in at 4,000 degrees Celsius. A noticeable exception to this rule is that when certain gases are kept under low pressure, like neon tubes or fluorescent light bulbs, they turn into plasma at low voltage and give off quite a bit of light and very little apparent heat. This property disappears when the gas is exposed to atmospheric pressure. 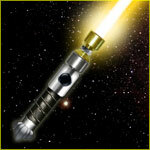 By this token, a toy lightsaber made from a neon tube is, in fact, a very real plasma lightsaber. Confining the plasma would allow you to lengthen the torch. In some applications, the plasma is confined in a quartz tube which is extensively gas-cooled to prevent it from melting. You can contain plasma using an electromagnetic field, a sort of a magnetic bottle. This is what is used in fusion experiments, where plasma atoms are encouraged to fuse within magnetic confinement. If you contain the plasma, then you can get it to extend itself longer because there's less diffusion of the plasma's energy. You might even be able, under certain conditions, to magnetically repel the lightsaber of an opponent. It is simply too easy to jam a lightsaber that is relying on magnetic fields, so we don't recommend this design for lightsaber dueling. All in all, we think the unique properties of plasma make it better suited to industry than weaponry - at least for the time being. 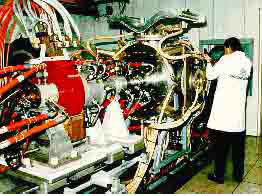 The biggest limit to plasma research right now is the availability of energy for the plasma generators. If vast new energy sources were to open up, some researchers suggest, then plasma research would probably accelerate to levels we can't imagine. Only then will a Jedi’s lightsaber can be a reality.